Certainly, one should pay a visit to the “Northern capital” of Iceland. The stunning old city was founded in 9 century and still plays important role for the country. There are many tourists attractions that you can find in Akureyri: gorgeous Lutheran Church, beautiful botanic garden, mountain Sulur, which is a great spot for hiking. If you go a bit out of the city, you will discover unique place, that was used to be Medieval trade market. Also you can go to Grimsey island with amazing views on Arctic Ocean and hundreds of seabirds! 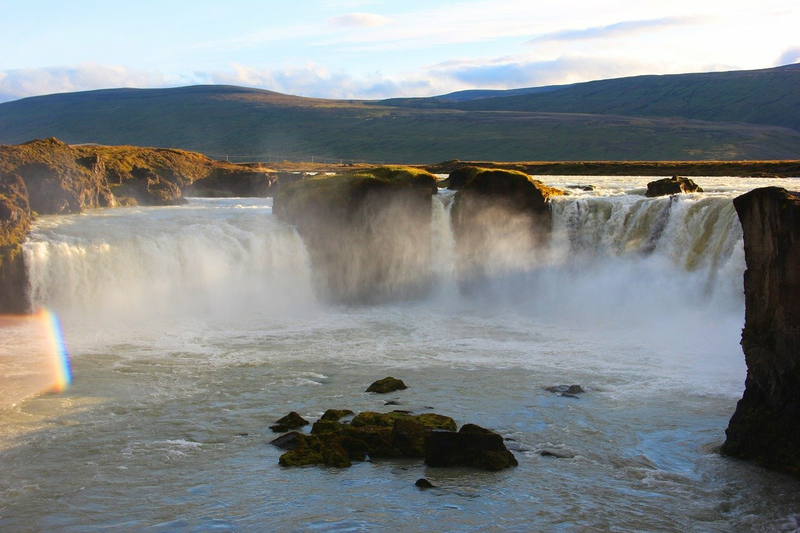 There are many waterfalls in the region, but perhaps the most well-known are Dettifoss and Godafoss. The former is located in Vatnajökull National Park and is so powerful, that you can feel vibration just standing next to it! Godafoss on contrary is mostly known for its historical role: when Iceland adopted Christianity, the statues of Nordic Gods were thrown into the water. This place would be perfect for exploring: geothermal water, old caves, spectacular lake. Mývatn Nature Baths is as famous in North Iceland as Blue Lagoon in the South, the big advantage of this place is that it is less crowded as its “southern brother”. Lofthwllir cave was formed more than several thousands years and has absolutely unique atmosphere. And of course amazing Mývatn lake is a great place to walk around and observe natural habitat of hundreds of birds. In case you love hiking, there is no better place that this stunning canyon with a shape of a horseshoe. It is located in Vatnajökull National Park and has a small lake, which has a great diversity of waterfowl species. Also don’t forget to find out about the best explanations, why the canyon has such a unique shape, our favourite theory: it was formed, when Norse god Odin’s horse touched the ground in this part of Iceland. Definitely “must see”! Iceland is famous for its almost out of earth experience, but there is no better place to feel it as Askja. It has such a breathtaking lunar-like landscape, that astronauts from Apollo programme actually trained here! Another reason to visit this stunning caldera is crater Viti, which is really popular bathing site both among locals and tourists. See you in North Iceland!